I was fortunate to take part in this year's mission sponsored by the University of the Philippines Medical Alumni Society in America (UPMASA), which took place in Siaton, Negros Oriental about 375 miles south of Manila. Siaton is a rural community with a population of approximately 70,000. Their main livelihood are fishing in the coastal areas and farming in the inland areas. The people in the community earn about $1-2 a day many of whom have never been evaluated by a physician. When the community received word that US-trained physicians would be coming to the area offering free medical, dental, and surgical services as well as free medications, they came in droves. Patients came from all over the district and were even offered free bus transportation sponsored by their congressman in order to be seen by a doctor. As we approached the city's gymnasium-turned medical clinic at 8:00am Monday morning, I found it extremely overwhelming to see hundreds of patients already lined up and triaged awaiting our arrival. One by one they talked about their medical ailments which ranged from chronic cough to unexplained weight loss. I diagnosed a few patients with active pulmonary tuberculosis by CXR and saw cases suspicious of scrofula, phylloides tumor, and neurofibromatosis which are all uncommonly found in the US. I also treated several common conditions such as gastritis, UTI, and asthma but in volume. However, unlike patients who live in developed countries that have access to free clinics and can afford generic medications, I found it very difficult managing them. For instance, it was extremely frustrating to provide only a 2-week supply of Motrin to someone with advanced gouty arthritis or a 30-day supply of Metoprolol for uncontrolled hypertension knowing that they will unlikely follow up with a doctor for their chronic conditions due to financial constraints. However, after every encounter, my spirits would be lifted. Without fail, I would receive a big smile of gratitude from each patient who appeared to be happy that I had simply listened to their complaints and offered my clinical recommendations. It was these encounters that I remember the reason why I entered medicine in the first place. 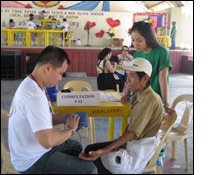 They gave me the energy to continue seeing patients until all had been evaluated. I never knew that I had the strength to see over 40 patients a day. By the end of the mission, over 3,000 outpatient medical consults were provided to the community. I feel both humbled and prepared to take on my role as a clinician. Traveling halfway around the world in order to help those in need was extremely rewarding and I am blessed to have been supported by the Benjamin Josephson Foundation.